I love True Detective. I think it is as brilliant and unique a show as I have ever seen. Everything about it has been amazing, from the writing to the direction to the brilliant lead performances. But as pointed out by some commenters in the recap of Episode 5, the show is narrowly focused on the two white male leads leaving everyone else undefined and in the background. This got me thinking about my own experience as an African-American male experience media. Growing up my main love was reading fantasy. Giant epic fantasy books that were part of 40 volume series(or something like that). So as a black teen and later man, I rarely if ever read about someone that looked like me. I coped in true sad sack fashion by imagining myself along for whatever adventure I was reading about. Its only over the last few years that I have become more active in seeking out more diversity in the things I love and doing what little I can to aid in the seemingly endless uphill climb to change that. In fact I was going to pass on True Detective for that reason, not wanting to support a show that seemed to be walking well worn paths, no matter the quality. But then I heard people talking about it and gave it a chance and I'm glad I did. Still, watching True Detective I am acutely aware of how white and/or male it is at all times. I often think about the second season and imagine various female/POC leads that could take over the series going forward. But at the same time I'm also aware that I'm watching truly special television, something that blends the real with the surreal effortlessly and with amazing effect. Does one cancel out the other? I still read fantasy series like A Song of Ice and Fire and Prince of Nothing/Aspect-Emperor that manage to be subversive while remaining in line with traditional works in terms of cast make-up and diversity. I love the ideas, the imagery, while still thinking this would be even more amazing if it did not follow the same path where anyone not fitting into the White Male "norm" is marginalized or presented as a hive-minded other. 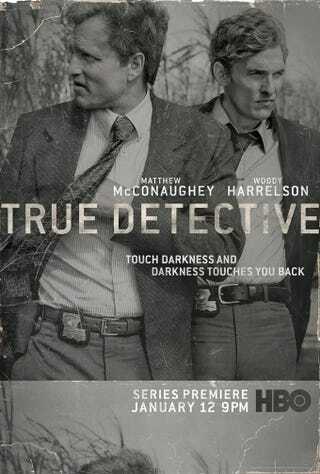 With True Detective it is slightly different. I feel that the story they are telling has to be the way it is. That's not an endorsement or me saying that I don't want something more varied in cast. I think this story, set in the South in the 90s primarily, has to be told the way it is being told. This is about two men who believe they are masters of the universe, Cohle because he is smarter than everybody else and can see the why of almost anything, Hart because society has always told him that he is at the top of the pyramid. The show is at least partially about life and the universe disabusing them of that belief. Cohle loses his daughter senselessly and becomes a rambling pseudo-nihilist because he can find the answer to everything except the one question he wants answered, while Hart loses everything because he believes that the world serves him and he does not have to work to keep the people in his life. It would be hard to tell this type of story involving power(the illusion of it and its corrupting nature) in this setting without it being about white men. And something about changing the dynamics of what would have been a police department in the deep South in the 90s bothers me. It would ignore the good ol' boy power structure that still clings to life in the South, and tells part of the story in a variety of cases ranging from Trayvon Martin to Jameis Winston to Jordan Davis and far too many more to list. Portraying a South that is not populated by Martin Harts is not a South that I've known and experienced. Now if Cthulu appears in the season finale and steals all of Cohle's beer, maybe my opinion on the reality it reflects will change. But for now I love the show, I don't like the world it portrays and how too much of it still exists in the real world of today. Loving the show doesn't mean I don't want more diverse casting and writing across the board, and I'll be eagerly awaiting the cast and direction of the next season. I grew up in a media drenched society that tells me I barely exist and if I do so only on the fringes. No one like me gets to be the hero or save the world. Change is slow in coming and long overdue. Maybe I'm part of the problem, loving something that has no place for me or someone that looks like me to be in focus. I don't know, I believe that there should be a lengthy discussion about the needs of story versus the needs of a vocal audience demanding change. And a show like True Detective is a great subject for that discussion. Speaking for myself, my feeling remain complicated and contradictory on the matter, and for now I'm okay with that.